Professional troubleshooting kit for any CCTV engineer. The CCTVmate test monitor is supplied with a neck strap for secure one-handed control whilst being used up a ladder. In addition to its basic function as a camera test monitor, the CCTVmate has a number of built in test meters and is a professional troubleshooting kit for any CCTV engineer. A built in meter measures the camera's composite video signal and displays the reading over the camera's image on the 2.5" LCD screen. Also a built in multimeter can test the AC or DC voltage on power cables as well as testing for a break in the cables. The CCTVmate has a DC 12V output for providing power to a camera which will make camera testing using the CCTVmate a much easier task. 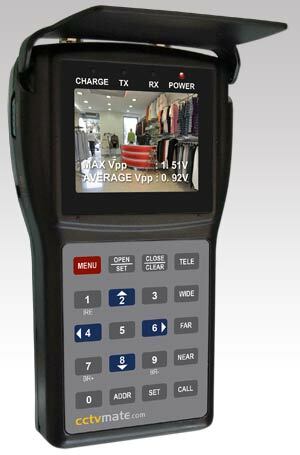 The network cable testing function allows end to end testing of network cable for correct termination, it can also be used to check and to calibrate CCTV monitors. For a truly professional edge, the CCTVmate has an RS485 connection to allow full directional and zoom control of a connected PTZ without the use of a separate keypad. This function enables pan/tilt, zoom in/out, preset setting and operation, speed adjustment etc via RS-232, RS422 and RS485 communications port. There are 29 RS485 protocols provided with the CCTV Tester including Pelco D and Pelco P.